This 2-Week Sleep Training Program is designed for a Baby ages 6-16 months old to sleep 11-12 hours through the night and establish a consistent daily nap schedule and routine. Learn how to prepare the sleep environment, develop a daily schedule, establish night and nap routines, strategies to handle wake-ups, and much more! A daily email sent each morning of the 14-day program with a heads up on what to expect, reminders, encouragement, and expectations. You will immediately receive log-in instructions by email with instant access to the Baby Sleep Plan and Training Videos. Your log-in access will remain active for up to 3-months from purchase, and you can download and print your Sleep Plan for as long as you need! 2-Weeks with a personal touch. A great way to learn and prepare on your own while checking in with Becca along the way to make sure you are doing it right! A perfect option if you are looking for that extra assurance, encouragement, or the ability to make adjustments and accommadations. Four 15-minute check-in phone calls with Becca during your 2-week training to make sure you’re making progress, staying on track, and making adjustments as needed. *International by video link. One 15-minute follow-up call with Becca a month after your training to ensure your family is sleeping well at night and those naps are coming together! *International by video link. Sleep Log interactive tracking where you will keep track of your daily progress online and leave questions and comments. Becca will review, monitor, and respond throughout the training. 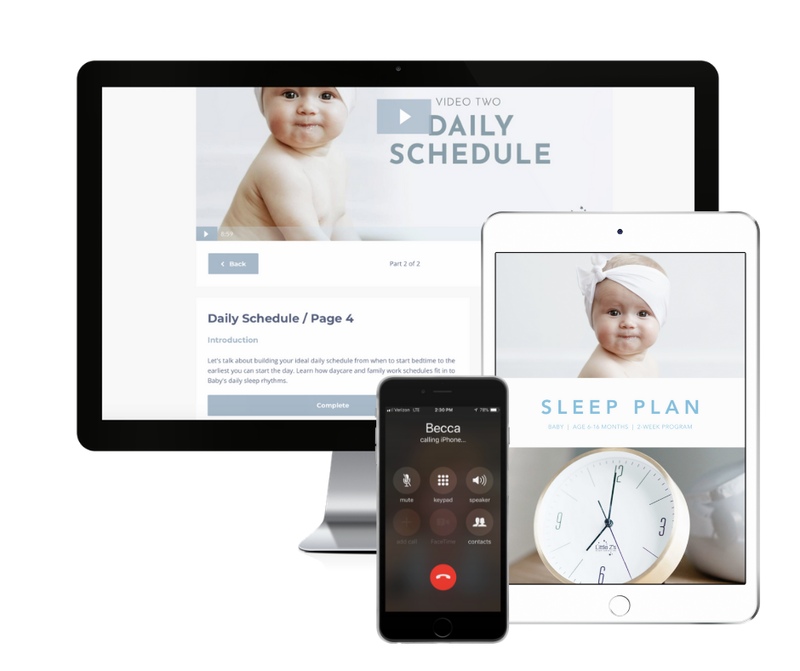 You will immediately receive log-in instructions by email with instant access to the Baby Sleep Plan, Training Videos, and a link to schedule your phone calls with Becca. One-On-One with Becca every step of the way. Becca will personally design and walk you through every aspect of your sleep training journey. This is ideal if you need that accountably and encouragement, you don’t want to do this alone, and you prefer a strategy and a plan tailored specific for your unique family situation. A tailored 2-Week Baby Sleep Training Plan in a downloadable, comprehensive, easy-reference format created for your family. Complete a questionnaire and Becca will design a plan unique for you. On-Call Voice and Text Message Support (8am-8pm) where you can get unlimited advice, encouragement, and accountability from Becca. Get answers and reassurance when you need it. Text or voice-message as often as you need and Becca will coach you along the way. *Voxer App download required. You will receive a personal email from Becca with a questionnaire to complete as well as a link to schedule your 1-hour individual consultation online through video communication software. Computer and internet access required. All time zones available, worldwide. Since you are getting Becca (no robots or computer generated sequences!!) it may take a few hours for me to email you! So sit tight, watch your inbox and imagine what you're going to do with all your free time when baby is sleeping!!! I come to you, and we do this together! We are all in! Whether you want the best accountability and encouragement you can find, or you simply enjoy a more face-to-face experience and are lucky enough to be local, it doesn’t get any better than this! Experience in person the secret to Little Z’s Sleep…the support! Enjoy additionally a little gift basket including a bottle of celebration champagne for that first night your baby sleeps all night! 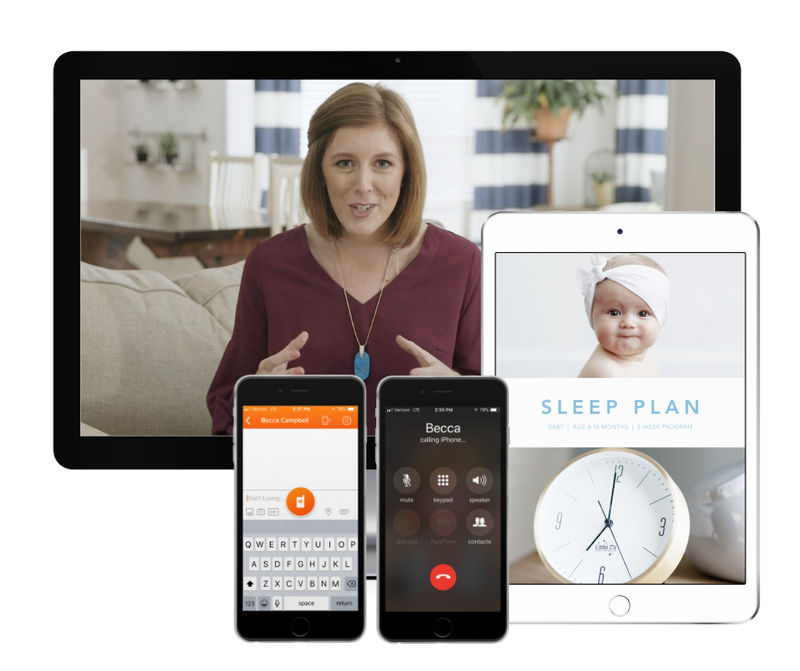 A private consultation in your home with Becca to understand your Sleep Plan, ask questions, and have the confidence to begin. Becca will personally help you through your first night of implementing the plan and strategies. Local clients only. Four 15-minute check-in phone calls with Becca during your 2-week training to make sure you’re making progress, staying on track, and making adjustments as needed. One 15-minute follow-up call with Becca a month after your training to ensure your family is sleeping well at night and those naps are coming together! This is a completely personal coaching experience, so let’s start by talking! Schedule a 15-minute Discovery Call using the button below so we can chat and make a plan!